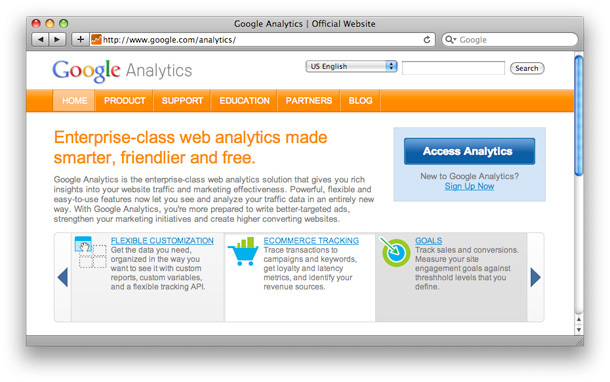 Google Analytics is the ubiquitous tool in website traffic analysis. From measuring your site’s day-to-day visitor influx, to the most commonly-typed search engine keywords resulting in hits, or the most referenced content, Google has created a tool unsurpassed in its usefulness. Amazingly, it is free. Not all site owners, however, are taking full advantage of the product features. Beyond installing the tracking code, you must set up goals within Google Analytics to harness its full potential. Goals enable you to go beyond counting visits to tracking your site objectives. Luckily, if you have yet to incorporate goals, they are fairly simply to add. Why do you have a site? Is it to sell merchandise, promote your services, or distribute information? Your answer will help you articulate your site goals if you haven’t already, and then you can enter them into Google Analytics. If you have an e-commerce site, your goal will probably be to sell products. If you are marketing your services, you may want visitors to submit a contact form. Site owners who are distributing information may wish that users spend a minimum amount of time on their site or visit a certain number of pages. Google Analytics can track all these objectives. On the next page, decide on your “Goal Name” and “Type.” If you’d like visitors to buy a product or submit a form, the type will be “URL Destination.” You can choose “Time on Site” to set a minimum visit time frame for a visit or “Pages/Visit” to set a minimum number of pages viewed. The “Goal Details” beneath the latter two are self-explanatory. If you’ve chosen URL Destination as your Goal Type, make sure it is a unique address. If the destination shares the URL with another page on your site, you’ll need to work with your web designer/developer to create a unique URL or to send a virtual page view request. Assuming it is unique, select the “Match Type.” Use “Exact Match” if your target URL does not change from visitor to visitor. If the first part of your URL remains the same, but the end may vary, choose “Head Match.” “Regular Expression Match” is useful if the middle part of your URL is constant, but the first or last part can change. 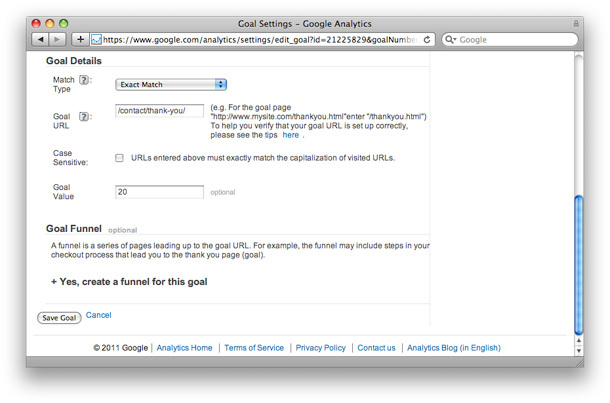 Next enter the Goal URL (minus the domain name), and decide if it is case sensitive (unlikely). The following field, “Goal Value,” may be difficult to determine if your objective is non-tangible (eg. lead generation); however, you may wish to try. How much is each lead worth to your business? Determining a value, even approximate, will allow your to generate Goal Value reports within Google Analytics. Beneath the details, you can enter a “Goal Funnel” if there are specific URLs a user must visit before landing on your Goal URL. Entering this information will help you analyze these steps and determine if there are any deterrents to completion. With your Goal Details entered, you can save your goal. If you’d like, add more goals to the same set or to a new set. You can configure up to 20 goals per profile. 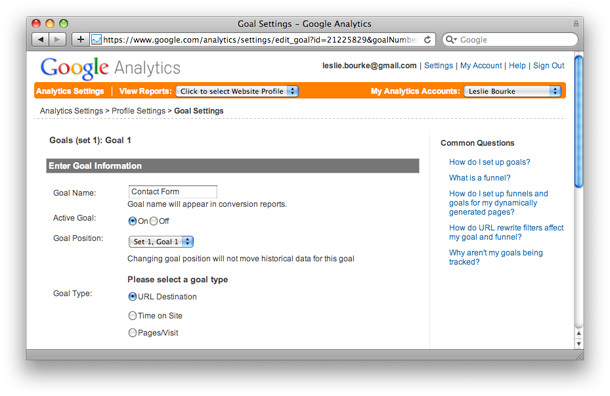 With goals integrated into your profile, Google Analytics offers more rich data. You’ll find the Goal tab within your reports is now populated with information. To determine which search engine has been sending your most valuable traffic, click “Traffic Sources” and “Search Engines” in the left sidebar, then select the “Goal Set 1” tab. You can also check out your most profitable Keywords. Or under “Visitors” and “Map Overlay,” observe which country and/or state have been sending you the most leads. Instead of merely tracking hits, Google Analytics goals allow you to evaluate the quality of traffic and how it relates to different report criteria. Site owners will find the resulting insights and action items invaluable. Thanks for your explanation. I’m going to read it again carefully and try to implement your suggestions. My main problem with my WordPress website is SPAM. Every day I have dozens of people talking about Viagra, other drugs, life insurance, and generally things that have nothing to do with my site. And they try to be sneaky: “I have been to many sites and yours has the best information I’ve seen!” Obviously, they hope I’ll approve the comment and somehow they’ll get a foot in my door. Any posts about this problem would be very nice!